The city of Manchester, England has countless statues that many people walk past, completely oblivious of the rich history behind them. From Richard Cobden to Abraham Lincoln, this article will tell the brief history of a selection of statues and why Manchester has decided to honor them by placing their statues in the center of the city. Su-Sam Tham explains. John Bright statue in Manchester, England. John Bright was a British Radical and Liberal statesman. He was born in Rochdale, England to a highly successful cotton manufacturer and was educated at Quaker schools in Lancashire and Yorkshire, where his interest in politics grew and he became committed to political and religious equality and human rights. Bright was a remarkable orator and was also seen as one of the most influential politicians of his time, serving as an MP for Manchester, Birmingham and Durham. He is best known for founding the Anti-Corn Law League with Richard Cobden, which aimed to abolish the Corn Laws. These laws imposed tariffs on imported grain to protect English farmers from cheap foreign imports and were successfully repealed in 1846. He was also a keen supporter of Abraham Lincoln and the Union during the American Civil War, though many in Britain showed considerable sympathy for the Confederacy. He supported the boycott of southern cotton despite his own family’s mills relying on it, as he believed slavery was morally wrong and instead advocated for cotton cultivation by free labor in countries such as India. To acknowledge his successful campaigning for the abolition of the Corn Laws, which had adversely affected Lancashire’s cotton trade as they relied on raw imports and exports for finished goods, Manchester commissioned two public statues in his honor; one inside Manchester town hall and the other in Albert Square facing the town hall, sculpted by Albert Bruce-Joy. Interesting Fact: Bright is credited for coining the phrases ‘to flog a dead horse’ and ‘mother of parliaments’. Richard Cobden statue in Manchester, England. Like Bright, Richard Cobden was a Radical and Liberal statesman, born in Sussex and raised in Yorkshire, where he received little formal schooling and became a cloth clerk at 15. He then started his own business selling calico prints and subsequently moved to Manchester, where his political career flourished as he was elected as the MP for Stockport. During this time, he campaigned against the Opium Wars and Crimean War, preferring to advocate for peace, resulting in him and Bright, the MP for Manchester, losing their seats in the 1857 election. However, the public forgave both for their anti-war stance as Cobden was later elected as the Rochdale MP and Bright as the Birmingham MP. As well as forming the Anti-Corn Law League, he was also known for the Cobden-Chevalier Treaty, which reduced or removed most tariff between Britain and France and was thus seen as a key stepping stone to free trade, a policy that Cobden advocated throughout his life. Cobden’s role in the abolition of the Corn Laws and association with other free trade campaigns led to Manchester erecting public monuments in his honor. His statue was created by sculptor Marshall Wood in 1865 and stands in St Ann’s Square. Interesting Fact: Cobden was extremely well travelled having visited France, Italy, Portugal, Spain, Switzerland, Egypt, Greece and Russia. An impressive feat considering he primarily travelled by coach and horse. William Gladstone statue in Manchester, England. William Gladstone was born in Liverpool to Sir John Gladstone, a merchant and MP. He was educated at Eton and Oxford before being elected to parliament in 1832 as the Tory MP for Newark and he held several posts in Sir Robert Peel’s cabinet, such as Chancellor of the Exchequer. In 1867, he became the Liberal Party leader and the 3rd Liberal Prime Minister in 1868, a position he held on four separate occasions. During his 12 years in office, his government set up a national elementary education program, extended the vote to a greater number of men and introduced secret ballots at elections. His reputation as a wise and respected leader, who championed social, economic and political reform, has seen him frequently ranked as one of Britain’s greatest Prime Ministers, recently coming third in the Daily Telegraph’s 2016 ranking of the top 10 greatest Prime Ministers. The statue was erected in Albert Square in 1901 at the Mancunian architect William Roberts’ request. 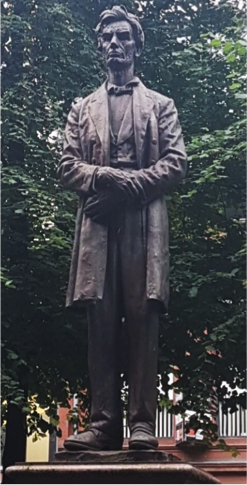 Roberts admired Gladstone and in his legacy, left £4,500 to build a statue of him for Manchester where Gladstone had visited and gave speeches on several occasions and he had even unsuccessfully run for Manchester MP as a Conservative candidate. Sculpted by Mario Raggi, the statue depicts Gladstone speaking in the House of Commons during the 1893 debate on the Irish Home Rule. Interesting Fact: Gladstone was Britain’s oldest serving Prime Minister, winning his fourth election at age 82 and resigning at age 84. Abraham Lincoln statue in Manchester, England. Abraham Lincoln is one of the most well-known and highly regarded Presidents of the USA, celebrated for preserving the Union during the American Civil War and for abolishing slavery in the USA. Born in a log cabin in 1809, Lincoln initially trained as a lawyer before entering the political arena by serving several terms in the Illinois state legislature and one in the House of Representative. In 1860, Lincoln won the Presidential election, becoming the 16th US President and 1st Republican President, inadvertently sparking a secession crisis in the South and ultimately the Civil War. During the war, Lincoln blockaded southern ports and some saw this as the cause of the Lancashire Cotton Famine, though the blockades were not entirely successful. Despite this, Manchester and Lancashire, areas heavily affected by the Cotton Famine, decided to support Lincoln and the Union by boycotting raw cotton picked by slaves. This meant many workers in the cotton industry lost their job, but their sacrifice was not unnoticed by Lincoln, who wrote a letter to the ‘working-men of Manchester’ to show his gratitude. The bronze statue of Lincoln, sculpted by George Grey Barnard, was commissioned by Charles Phelps Taft, the mayor of Cincinnati, Ohio and son of the former US President, William Taft. Originally meant to stand outside the Houses of Parliament in London, the statue was deemed unworthy for parliament as Lincoln was depicted wearing ‘normal’ clothes, rather than presidential attire and with his hand on his stomach, thus becoming known as the ‘stomach ache statue’. Instead, London received a different more statesmanlike statue and their loss became Manchester’s gain in 1919. The statue currently stands in Lincoln Square and the pedestal is inscribed with extracts of Lincoln’s letter to ‘the working-men of Manchester’, though ‘men’ has been changed to ‘people’ as Lincoln’s gendered address was seen as too sexist by Manchester council. Interesting Fact: Lincoln obtained a patent in 1849 for a device designed to lift riverboats over sandbars or obstructions in the river and is therefore the only US President to hold a patent. Queen Victoria statue in Manchester, England. In 1817, the death of Princess Charlotte, the daughter of the future King George IV and only legitimate grandchild of the reigning King George III, caused a succession crisis in Britain. This made George III’s sons realize that it was essential for one of them to provide an heir, so the following year, Prince Edward, Duke of Kent married Princess Victoria of Saxe-Coburg-Saalfeld and had their only child Alexandrina Victoria. From the beginning, Victoria was raised to be Queen and thus had a difficult upbringing. Her father had died before she was a year old, so she was raised by her mother under the ‘Kensington System’ resulting in a somewhat solitary childhood as her education and company were strictly regulated by her mother who isolated her from the rest of her family. Even King William IV, Victoria’s uncle, was denied access to her causing him to vow that he would survive until her 18th birthday to prevent her mother from becoming reagent. William was successful, as he died just 26 days after she turned 18 and so Victoria ascended to the throne as the sole ruler of Great Britain. Queen Victoria’s 63 year and 216 day reign had many significant successes as the first Wimbledon Championship was held in 1877, the first practical telephone was invented by Alexander Graham Bell, the British Empire reached its peak, and she was even crowned Empress of India. The sculptor Edward Onslow Ford was commissioned to create the statue of Victoria for Manchester, which she agreed to sit for, in commemoration of her diamond jubilee. Unfortunately, the statue was only completed and placed in Piccadilly Gardens in 1901 after her death. It was also originally intended for the tribute to be a marble statue, but this later changed to bronze after the Queen expressed concern about marble weathering poorly in Manchester’s smoky atmosphere. 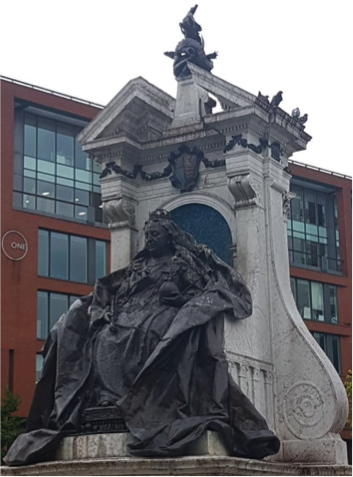 The statue is particularly significant because out of the 17 statues in Manchester city center, it is the only one to depict a woman and monarch. Interesting Fact: Queen Victoria survived 8 assassination attempts with 2 attempts made by John Francis. James Watt statue in Manchester, England. James Watt was a Scottish mechanical engineer and inventor born in Greenock. He was home-schooled by his mother, before attending the local grammar school where he excelled in engineering and mathematics. After leaving school, he moved to London and trained as an instrument maker, quickly surpassing the other apprentices as he completed his training in just a year, despite training normally taking up to 7 years. This allowed Watt to return to Glasgow and start a small shop making and repairing scientific instruments and it was while working there that the Newcomen engine was brought to his attention. He was given a model of the engine to repair and found it to be inefficient, so he began experimenting with steam to try and improve the engine, which he managed to do by designing a separate condensing chamber for the engine. Further improvements resulted in Watt’s engine being up to 5 times more powerful and over 50% more efficient than the original Newcomen engine. Watt’s engine gave way to highly efficient factories, mills and mines that produced 3 times more mechanical work for every ton of coal brought, meaning the owners earned more money and thus the prosperous economy of the Industrial Revolution was driven by Watt’s developments. His achievements were recognized in many ways - most significantly, the watt was named in his honor. 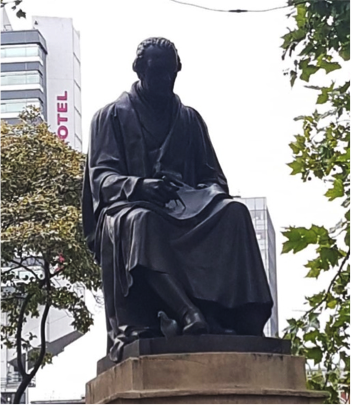 Manchester owes its titles as the world’s first manufacturing city and ‘Cottonopolis’ to Watt, so it is no surprise that the city commissioned William Theed to produce a bronze copy of Chantrey’s marble statue of Watt, that stood in Westminster Abbey, for Manchester. The statue was erected in 1857 and now sits in Piccadilly Gardens. Interesting Fact: To explain how powerful his steam engines were in a relatively easy and relatable way, Watt decided to compare them to the power of horses, which were at the time the dominating mode of transportation and thus horsepower, a unit of power, was invented. I hope that after reading this article you will be inspired to visit Manchester to see the statues for yourself and in the future, you will take time to explore the history of other fascinating statues that you may never have truly noticed. All pictures are taken by and provided with the permission of Su-Sam Tham. They may only be reproduced wit Su-Sam’s permission.